Oskar Schell is a precocious nine year-old who lost his father on the World Trade Center on September 11. A year or so into the death of his father, Oskar finds a mysterious key inside a vase on top of his father’s closet, along with an envelope on which the word Black is written. That leads Oskar to start a hunt around New York City’s five buroughs looking for the lock the key opens, whose owner may tell him more about his father and how he died. Extremely Loud and Incredibly Close came to my attention via a coworker. She spoke excitedly about it, so I thought I should read it. I started reading it years ago and abandoned it about page 50. But since the previous book I was reading this time around wasn't grabbing my attention, I took a look at my book shelves and decided to give this one another try. The only element that made me keep reading was Oskar and how authentic his voice felt throughout the novel. I had an extremely hard time reading the first 200 pages for several reasons: 1) I find hard to feel sorry for a character who was already dead when the book started; 2) I don't like when the author has the upper hand in the unfolding of the story (i.e., a mysterious character whose identity isn't revealed until further on); 3) the book structure is far from conventional--that chaotic structure is more associated with thought patterns, and I don't like books narrated in the way I think. However, as the novel reached page 208, I finally turned around and Safran Foer won me over. I loved the passage about New York City's Sixth Burough, narrated by Thomas Schell (Oskar's dad). I found very realistic the chapters about the bombardment of Dresden in WWII, and the endless loop in the news on September 11, 2001, about the Twin Towers on fire, people waving banners from the upper floors, and the buildings collapsing. I thought Safran Foer brought the story home by using repetitive phrases to depict an endless loop of news on cable television; the picture was very vivid. Although I considered Extremely Loud and Incredibly Close an uneven novel, it had laugh out loud moments, and the events on the Blackest Tuesday in history were approached with tenderness and raw vulnerability. “…When you fell asleep with your head on my lap, I turned on the television. People waving shirts out of high windows. People covered in gray dust. Have you read this novel? Do you agree or disagree with my assessment? Did you like it? Do you think there's a way that it could have been better? I'm glad you liked it, Judy. Maybe I wasn't in the right frame of mind to be particularly receptive, but as you read there were several things that bothered me. Oskar wasn't one of them; I thought he was hilarious and it broke my heart how sad he was for the death of his father. 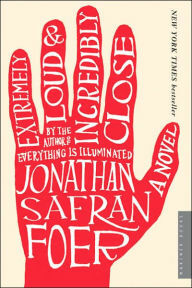 Safran Foer has one other novel titled Everything Is Illuminated, which was his debut as a novelist. I think you have hit on something. One does have to be in the right frame of mind for certain books, especially those with unconventional structure. I'm one of those readers who rarely gives up on a book, even if I can't really "get into it" at first, but the ones where I've been tempted have been those that tell their stories in a chaotic and seemingly unfocused way. I haven't read this book, but maybe I should give it a try. I think you should give it a try and see for yourself. Most people like it, I think, but I wasn't a fan of the structure. I ended up liking it though, but it was thanks to the story; that weird structure never grew on me. I know exactly what you mean, except that I heard of the hype before I read the book; I guess I was expecting fireworks. Apparently it was named Best Book of the Year by several publications in 2005, so I wasn't wrong in expecting to be blown away. I saw the movie of this but didn't read the book. I remember liking the movie but now I can't recall it too much other than it was sad in parts. I definitely want to watch the movie to compare since the book didn't have all the elements that would have made me really like it. I listened to this on audiobook several years ago and remember thinking the movie was great. Very rarely do I enjoy a movie version of a book! I tend to watch the movies rather than read the novels they are based on; that's the case because I didn't know most of those movies were based on books. I want to watch this movie version to see if I like it better than the book. For me the novel was so meh.